Many may see May Cause Love as controversial seeing that the topic of abortion is still considered a taboo subject not meant to be discussed openly. However, Kassi Underwood does an imagine job recounting her own story in a way I’ve never read before. Underwood’s story is unapologetic and one of conflicting moral background that clearly shows her struggle and relationship to abortion. There is such importance in the fact that Underwood was able to tell this story, let alone put it to pen and paper. This is her story and her story alone. In a world where the public is so unable to discuss abortion unless it’s to demonize the procedure and threaten to take over the rights of a woman’s uterus, this is a story that needs to be heard, read and told over and over again. 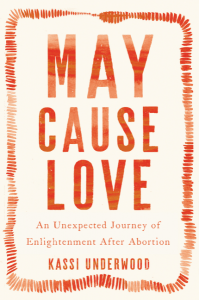 May Cause Love is a great step towards opening up the dialogue for everyone about abortion and creating a safe, understanding emotional space for women to discuss their own stories or apprehensions. It’s a fantastic, quick, sometimes funny read that I would recommend to anybody. Kassi Underwood grew up in Lexington, Kentucky. Her work has been published in the New York Times, The Atlantic online, The Rumpus, and Refinery29. She holds an MFA in literary nonfiction from Columbia University, where she taught on the faculty of the Undergraduate Writing Program. She has been a guest on MSNBC and HuffPost Live, and a speaker at colleges, comedy shows, and faith communities nationwide. Kassi lectures about personal transformation, social justice, and the spirituality of abortion. She is a student at Harvard Divinity School and cohost of the podcast Spiritually Blonde. Find out more about Kassi at her website, and connect with her on Facebook, Twitter, and Instagram. Abortion is such a hot button topic in today’s world and I think we often forget to look at the impact that is has on individual people, for better or for worse.